Something odd happened to me earlier this month. One of the developers I work with is creating a video game and wanted to know if I would be a good fit to help him with his game’s character dialogue. To assess this, I sent him a sample excerpt of my latest work in progress. He enjoyed it, and took it upon himself to buy a copy of Portrait of Woman in Ink, completely unsolicited. After finishing the book, he expressed his undying love (okay, moderate enjoyment) for it and asked me to sign on for his video game project. In return for this (apart from monetary compensation ‘n sitch) I asked if he’d be so kind as to post a review of my book that reflected his honest opinion of it. “We cannot post your Customer Review for “Portrait of Woman in Ink – A Tattoo Storybook” to the Amazon website because your account activity indicates that you know the author. 1) How does Amazon know who I know in personal life based on Amazon account activity? I never did any business with said person over Amazon, and like I said, I’ve only exchanged reciprocal me@mine.com emails with this person a small handful of times. 2) Does this mean that Amazon can infer that anyone I email from my personal email account is someone whose book review cannot be trusted? I email a lot of strangers, especially in my volunteer work with Velma Magazine. If they”re not snooping on my email, does this mean that any time I gift a book blogger a copy of my book in exchange for a feature on his or her blog as a Kindle gift (which is the preferred method nowadays), Amazon is going to reject that review based on the fact that “account activity indicates that you know the author”? 3) If someone who happens to know me in real life legitimately purchases my book and reads it, what difference does it make? Whether they enjoy it or hate it, the fact that they know me should have little to no bearing on their honest review of my work. 4) Why would a review by a individual with a personal connection to me in real life automatically be branded as “advertising, promotional, or misleading”? I have a hard time believing this person’s review contained any content that could be construed as such. 5) Why you gotta spy on me, Amazon? I publish on your platform and order lots of your retail goods and not-so-goods so as to take advantage of the two-day shipping I pay you for with my Amazon Prime membership. People have badmouthed you and I have always defended your awesomeness. WTF Amazon? So for those of you know me as a close friend, Twitter follower, or anyone I’ve emailed ever, I regret to inform you that if you want to read my next book and give an honest review of it, I will have to sever all personal ties with you and go back to communicating through a middleman like the resistance did on New Caprica, since Amazon is going all Cylon ruler on me. Anyone else want to weigh in on this? Am I overreacting or is Amazon being all big for its britches? P.S. 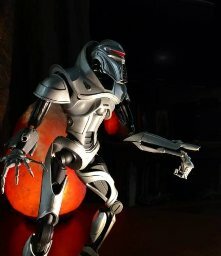 The Cylon above is an image from Amazon. So take that. @KellyHitchcock @MondayBlogs I’m flabbergasted! Amazon is definitely wrong! A review is a review!